DC recuts the entire 'Knightfall' saga! This title contains never-before-collected tales from Detective Comics #667-670, ROBIN #1-2, Batman: Shadow of The Bat #19-20, Batman #501-504 and Catwoman #6-7. 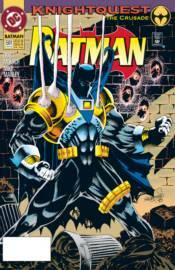 The new Batman's deadly crusade against the criminals of Gotham City begins! Azrael has assumed the role of the Caped Crusader, but without Bruce Wayne's steadying influence, the new Dark Knight is swiftly getting out of hand, alienating both Robin and Commissioner Gordon and hurting innocent people.